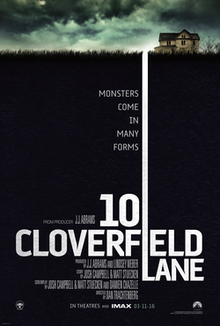 10 Cloverfield Lane is a movie nobody had any idea existed until two months ago, when the trailer was released and the movie was no longer kept a secret. The trailers (whose very secretive style comes from producer J.J. Abrams) did not reveal anything about the story but still intrigued me. It was only referred to as a “spiritual successor” to Cloverfield, and never a sequel. We never knew what to expect, and with such an incredible style of marketing, 10 Cloverfield Lane ultimately did not let me down. The thrilling plot buildup always kept me on the very edge of my seat, thanks to spectacular cinematography and directing from first-time feature-length director Dan Trachtenberg. The movie almost felt like a mystery, but much more like a thriller with lots of twists and suspense that kept my eyes on the screen. The cast is outstanding, with a great leading role played by Scott Pilgirm vs. the World‘s Mary Elizabeth Winstead. She conveys her character very realistically, and felt like a terrific protagonist. John Goodman is fantastic in his role as a man who may or may not be a psychopath, and John Gallagher Jr. is also very good in the one other role in the film. There is also a voice cameo in the film that I was not able to catch, but I was informed by the credits, so stay on the lookout for a familiar voice toward the beginning of the movie. The movie pulled me in from the very moment it started, and I was always guessing how the movie would turn out to be, as many pot points turn out to not be what they seem. The reason I did not mention the plot in the beginning of this review is because it is best to walk into this film without any expectations at all, like I did. The movie’s trailer tells you nothing about the movie’s plot, and I had no idea what the film was actually about. The trailers don’t give you anything about the story, and only teases a few scenes from the movie. I was glad I knew nothing about how the movie would play out or even the basic plot, because part of the great experience sitting through this movie was the suspense and the feeling of oblivion throughout. The movie’s genre and story-line is nothing like Cloverfield‘s, so don’t walk in expecting another found footage film filled with destruction and monster madness. This movie is a claustrophobic thriller with a cast about as large as Gravity‘s, and it’s a much better film as well. My one issue with the movie is that the ending could have been handled a bit better, as it feels like a mystery that can only have two outcomes, and it ends in the one way I was really hoping it wouldn’t. I feel it ended that way for fans’ sake, but it may have been a better film with the other outcome. I did not hate the ending though, it was enjoyable (but also rushed), and leaves a few loose ends for you to guess for yourself. I am so glad I had the opportunity to watch a film like 10 Cloverfield Lane in theaters, it’s definitely worth a watch if you are a fan of thrillers, and want a movie to keep you on the edge of your seat. This entry was posted in Action, Drama, Science Fiction, Thriller. Bookmark the permalink. From your review, the movie seems so great and so enticing. That was a mistake I made when I published the review, I immediately edited it to four slices.